Importer of Midas swimming pool, spa equipment and accessories from Germany from pump, filter to all pool equipment like basin fittings, under water lights, SS ladder, solar heat pumps etc. Automatic pool cleaner for private pools to 10 m of length, with PVC-combi-scrubber. Clean the bottom of the pool by programming by the user fully automatically (3 hours). Low-maintenance. Cable length 17 m. Incl. stand. 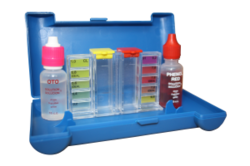 PH/OTO, transparent tester with easy legible and reliable colour scale. Manufactured of UV resistant and long lasting plastics. Packed in tearproof PE bags. With functional excenter length adjustment, ergonomic soft hand grip. Patented system for easy and quick assembly of the cleaning accsesories. UPVC butterfly valves ideally suited for flow control using minimal piping space. They are resistant to several chemicals and offer excellent flow characteristics. Butterfly valves can be used for special applications like isolation, throttling and control. Bobbin wound filters are manufactured from the highest grade non-corrosive material and employing the latest in filament winding techniques, ensures years of trouble free operation. Cartridge filters use a paper-type cartridge as the filter media. The Cartridge Filter features a thermoplastic chemical resistant tank with no-tool servicing and a scoreless cartridge for easier cleaning.A cartridge filter is much smaller than a sand filter, and is usually tall and narrow. A counter current jet is designed to produce sustained water flow towards the swimmer to support their body while swimming. Counter current jet is the perfect accessory for exercise, fitness and fun. With a counter current device installed in the pool the training effect is that of a much larger pool. Wall conduit with threaded internal used to fix wall & suction inlet. Can be easily cut to required lengths depending on pool shell thickness. Internal non threaded wall conduit can be used to fix 50w light. Conduit is recomended to be fix before concreting. Body and grille in ABS. Screws in S.S. To be glued to internal Ø 63 mm. Drain grill (230mm x 230mm) supplied with fixing screws. Recomended Minmum 2 nos. of drain required per pool. Main drain with 250mm dia. Recomended to be fixed before floor casting with minimum 2 nos. of drain per pool for safety reasons. Unique design with ss screw to adjust the flow. External connection 2" / 63mm male threaded. Internal connection 1.5" / 50mm glue fixing. Ladder width 500 mm with Ø 43 handrails in mirror polished AISI-304 stainless steel. Complete with fixing anchors, earth connection, with all accessories and slip-proof steps.Distance between rails: 500 mm; distance to wall: 180 mm; distance between steps: 250 mm. Deck box made up of strong white ABS material. Its compact cable with all under water lights. Conduit hose : For connection from light niche to box, length 1 m.
Extreamly silent pump, at 1,450 rpm until 10HP. High flow self priming pump with motors at 1.450 rpm & 2.850 rpm, designed for big filtration installations. Equipped with a big capacity strainer in the inlet that among its excellent performance generates a high filtration capacity. A self priming pump for pools with a large prefilter to generate a very high filtration capacity. A filter with a transparent polycarbonate lid to be able to easily see the interior of the prefilter basket. No possible electric contact with the water as no part of the motor is in contact with it. Chrome plated Pneumatic push button require to actuate Pneumatic switch. Comes with the provision to fix Pneumatic hose. A Perfect replacement of par 56 Halogen lamp. The unique flat design gives a better appearance. It gives double brightness and makes the pool glitter. A perfect replacement of traditional 300w halogen lamp. 50w/12v under water light comes along with niche. Niche to be fixed by the time of concreting. Easy to remove using the faceplate as a tool to replace the lamp. 100w/12v wall mounted under water light built from suitable heat-resistant plastic materials, White in colour. ABS faceplate fixed to the wall by means of a reinforced plastic cross plugs and screws. Supplied with 2.5 m cable & 100w – 12v halogen lamp. 300w/12v niche type under water light. Supplied with niche, ABS flange,1m flexibale cable, with par 56 bulb and screws. Housing made of Polypropylene + fiber glass. 300w, 12v bulb. With robust PPGF and UV resistant body and bristles. Incl. 20 x PH/CL test tablets each, transparent tester with legible and reliable colour scale. With reinforced and UV resistant PPGF frame and extra strong net, with integrated dirt collection flaps and flat frame design. With reinforced and UV resistant PPGF frame and extra strong and finely woven extra deep net, with integrated dirt collection flaps and flat frame. 15 L Skimmer with standard throat. All exposed skimmer parts are UV resistant comes with silent wier flap and flow regulation plug. 1 1/2" female - 2" male suction connections. Ø 50 mm solvent connection also provided. Overflow connection Ø 32mm. 17.5 L Skimmer with wide mouth throat .All exposed skimmer parts are UV resistant.comes with silent wier flap and flow regulation plug. 1 1/2" female - 2" male suction connections. Suction inlet comes with removable plug to fix vacuum hose connection size 40mm, can be fixed with Wall conduit. Designed with eyeball knock off arrangement to adjust the flow & Direction. Chrome finished air volume controller . Required to controll air to venturi systems. Dia 90 mm spa drain. Comes with Dia 90mm /63mm reducer connection. Recommended 2 drain per seat. Lights for fountains or water features can either be halogen or LED. LED (light emitting diode) lights are a newer technology that offer many advantages: the bulbs last 10,000 hours+, they are cool to the touch and are very energy efficient.